The Money Advice Trust, Money Advice Scotland and Citizens Advice Scotland are delighted to announce that Wiseradviser Scotland has gained accreditation from the Money Advice Service, as part of their Quality Framework for Individuals, in the Initial Contact, Support Work, Advice Work and Casework/Specialist debt activity sets. For each of the debt activity sets, we have introduced a core cluster of Wiseradviser courses (both face-to-face training and e-learning) that meet all the accreditation requirements. This core programme is the minimum training you need to demonstrate that you have completed accredited training. Where there is repetition of courses within the debt activity sets, you will only need to complete this course once. Please note: Completing these clusters of courses alone will not equip you with the essential technical knowledge needed to offer effective debt advice. However, completing these clusters will support you and your agencies to demonstrate that you meet the Money Advice Service’s Quality Framework for Individuals requirements. We recognise that you need to learn a lot more in order to provide accurate and effective debt advice, which the entire Wiseradviser learning programme offers. We highly recommend you complete all of the optional courses that are relevant to your role. 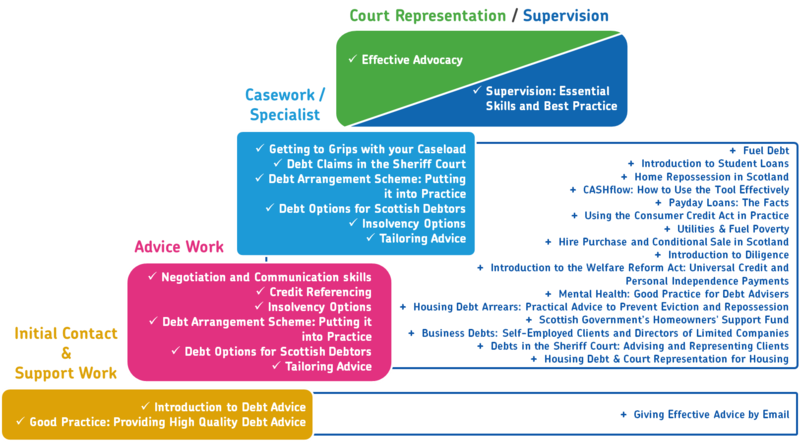 The diagram below shows what courses form the Wiseradviser Scotland pathway (the brightly coloured boxes with white text) and what the relevant optional courses (the white areas with dark blue text) are for each debt activity set. Click the diagram to view a larger version (PDF). For example, if you are new to debt advice, you would complete the Initial Contact & Support Work core courses (in the yellow box), Introduction to Debt Advice and Good Practice: Providing high quality debt advice first, then complete any of the optional courses, at that level, before moving up to the next learning pathway. To be equipped to give good and effective debt advice, you will need to complete the core courses within a debt activity set and we recommend you complete as many of the optional courses as are relevant to your role, before moving on to the next debt activity set cluster. What is the Money Advice Service Quality Framework for Individuals? The Money Advice Service sets out the minimum knowledge and skills debt advisers need, mapped against the National Occupational Standards (NOS). They use this to accredit organisations that deliver debt advice training and qualifications against their Quality Framework. The processes of all the organisations that administer and deliver Wiseradviser training are also assessed as part of the accreditation procedure. Agencies who receive funding from the Money Advice Service, or who apply for quality marks that adhere to their framework, will need to prove that their advisers have completed accredited training. Further information on the Quality Framework can be found on the Money Advice Service website.